The Colorful Panels and Symbols and Have Effects That are Just as Colorful! 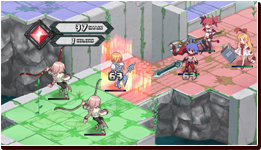 In the Netherworld where Laharl and company roam, there are places where the ground is colorful. These sections of the ground are called Geo Panels, and they contain spiritual power that make up the Netherworld. 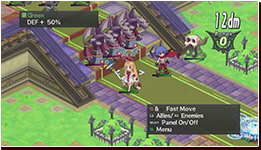 Units that stand on Geo Panels are affected by the these powers. 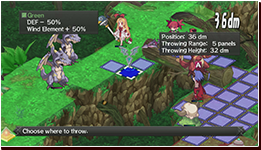 Example 1: The ATK of units on these Geo Panels are increased! 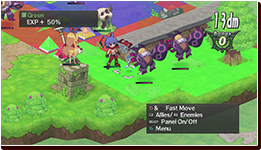 Example 2: More EXP is giving to units standing on these Geo Panels! Crystals of Spiritual Power, Geo Symbols! Geo Panels grant many different kinds of effects, but it's not actually the Geo Panels themselves that possess the effects. It is actually the Geo Symbols that provide the effects to the Geo Panels. Geo Symbols are crystals made of spiritual power that fuel the Geo Panels. If there are multiple Geo Symbols on the same color of Geo Panels the will all grant their effects to all Geo Panels of that color. 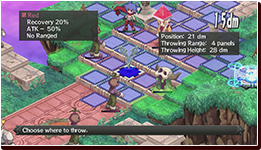 Use Geo Panels and Symbols to Get the Upper Hand! Geo Symbols & Geo Panels, when combined, provide Geo Effects. There are both positive and negative Geo Effects. Place your units on positive Geo Panels and drive off your enemies! You can Lift and Throw Geo Symbols. You can add multiple effects to one color, remove negative effects, or give them to enemies. The combinations are endless! Geo Effects can be really powerful, so Throw to your heart's content! You can destroy Geo Symbols to get rid of them! You can attack them from far away to remove negative Geo Effects. When a Geo Symbol is destroyed, the color of Geo Panels that it was on will change to the Geo Symbol's color. 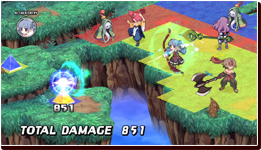 Units that are standing on those Geo Panels will take damage when they change. Destroying Geo Symbols Can Greatly Increase the Bonus Gauge! 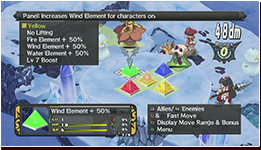 You fill the Bonus Gauge by attacking enemies or using items. 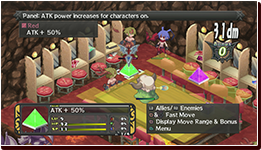 When you finish a battle, you will gain items according to how many Bonus Gauge Levels you attained. But you can also fill the Bonus Gauge by destroying Geo Symbols! When Geo Symbols are destroyed, they change the color of the Geo Panels it was on. 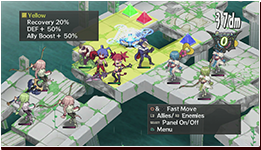 The more Geo Panel colors you change, the more the Bonus Gauge will get filled. Depending on how you place the Geo Symbols, you can create chain reactions that will massively fill the Bonus Gauge all at once!